Hello, my name is Jason Wang and I’ve just finished my second year as a PhD student at USC working with Dr. Donal Manahan. I’m excited and thankful for the opportunity to continue my research activities this summer as a graduate fellow supported by the Wrigley Institute! I am primarily interested in asking the question of how it is that marine animals survive, cope with, or thrive in the environments they are found in. This question takes me down many roads branching from the study of their physiology to cellular biology & biochemistry, all the way down to their genes & DNA. The large-scale larval culturing facility at Wrigley Marine Science Center. Each tank holds 200 liters of pristine seawater pumped from the waters around Catalina Island, and houses 2 million oyster larvae. Why does this matter? Well other than being just plain interesting to me, the research I’ll be doing has implications for how marine organisms may fare in changing oceans, how seafood is produced to sustain a growing population, the cycling of organic matter in the water column, and finally improving our understanding of basic biological processes common to all animal life. This summer I will be using the white urchin Lytechinus pictus and the Pacific oyster Crassostrea gigas as model organisms for studying how larval growth rates are influenced by the physiology of feeding. One of the first observations many people make when seeing an urchin larva for the first time is how its body resembles a space ship. Most marine invertebrates have a larval form built for dispersal that is distinct from its adult form, and this concept makes the analogy of a space ship very fitting. Much like how a space ship must contain all of the oxygen, food, and fuel/energy to sustain a crew, a marine larva is endowed by its mother with an energetic substrate reserve of lipids, proteins, carbohydrates, as well as the cellular machinery required to fuel its development and eventual settlement in a foreign environment. Where the analogy breaks down (with our current space travel technology), is that eventually the larva will run out of its embryonic resources, and any chance of survival to metamorphosis must be fueled by feeding on an outside source of energy. There are many “strategies” that help larvae to overcome these limitations. For example, the larvae of some species may require less energy to perform essential cellular processes like synthesizing proteins or transporting ions. On the other hand, other species may have more effective means of acquiring food or nutrients. Regardless of the strategies, larvae have but one goal – to develop to a stage where they are competent to settle down in a favorable environment. As you can imagine, there’s only so much that the larva’s biology can contribute to its success. The environment plays a huge role in influencing a larva’s ability to adapt or thrive. However, not all larvae are equal, and it is the goal of my research to study what it is about certain aspects of larval physiology that allow them to thrive and grow quickly in otherwise stressful conditions. This summer I have set up several cultures of white urchin and pacific oyster larvae. Each culture can contain hundreds of thousands to millions of larvae such that there is ample biomass to make a multitude of measurements on a common pool of animals. My larval cultures are exposed to various food concentrations, temperatures, and levels of CO2, and I will be tracking the total energy available to them (through respiration), how much protein, lipid, and carbohydrate they consume and deposit as biomass, and finally how quickly they synthesize and turn over the proteins in their bodies. All of these measurements reflect some aspect of energy acquisition, recycling, or utilization and provide indices of growth efficiency. My hope is to provide quantitative values to describe how larval development is affected by future climate scenarios. It’s not enough to just say that climate change is affecting marine life – I want to know specifically by how much and in what way life is affected; but more importantly, what might the “winners” in future oceans look like and how can we use that information to maximize the way we grow food in the oceans? This entry was posted in Graduate, Wrigley Institute on June 26, 2017 by Jessica Dutton. It’s that time of year again: leopard sharks are in the cove, the green grass has shriveled to classic SoCal brown, and Research Experience for Undergraduates (REUs) have arrived for the summer. Mentoring REU students at the Wrigley Institute has become a part of my graduate studies that I genuinely look forward to. These students are top picks from around the country, some of the brightest aspiring scientists to be found anywhere, who come to Catalina Island for a summer of high-level research science. Their projects range from studying ecosystem level bacterial profiles, to the archaeology of Catalina’s first inhabitants, to ocean acidification and marine toxicology – and everything in between. How cool is that? Each year the Wrigley Institute hosts approximately 12 REU students, and these cohorts form a bond that will last throughout their academic careers. As an undergraduate, I had the pleasure of participating in an REU program at Friday Harbor Labs in Washington State, and have enjoyed watching my peers from that year go on to earn PhDs, take jobs in scientific policy management, and impact the world through non-profit environmental work. This year’s Wrigley REU cohort will do no less, I’m sure. 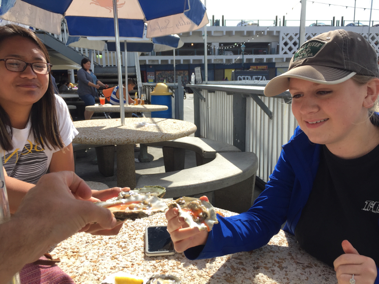 Lauren Averilla (left) and Megan Fogle (right) enjoy some delicious Pacific Oysters during their first week in California as REU students. This summer I have two students that I am mentoring, Megan Fogle and Lauren Averilla. Together, we will be studying bivalves in the context of microbiomes and pollution. Bivalves are molluscs that have two shells (hence, “bi”-valve). Some of the more familiar varieties include the mussels, clams, and oysters. All tasty, too! In fact, I treated our REU students to some fresh oysters as my way of saying “welcome to California!”. I don’t bring up the fact that bivales are highly edible by accident: that’s one of the main drivers of the research we are conducting. You see, bivalves are an extremely important food crop for the future of sustainable ocean farming, referred to as aquaculture. Currently, humans are over-harvesting our wild fisheries, are under feeding approximately 1 billion people across the planet daily, and are putting aquatic organisms under extreme stress due to pollution. One way to curb some of these monumental human challenges is to efficiently and sustainably farm the seas, and bivalves fit the bill. However, we know comparatively squat about bivalves next to land-grown foods like corn, pigs, and cattle. In fact, it is 100% guaranteed that you are eating a wild animal if you slurp an oyster at the fish market! 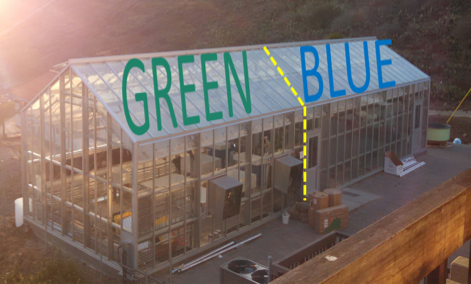 The research greenhouse at the Wrigley Marine Science Center, divided into the “Green” (terrestrial) and “Blue” (marine) houses – my aquaculture work is being performed on the blue side. That’s where our research priority comes in; we want to know what can impact these molluscs in their natural environment. In a commercial context, we are interested in this so that we can create ‘improved’ bivalve crops. Keeping that in mind, this summer Megan is looking into how fertilization in Pacific oysters might be affected by pollution in the environment. Does copper affect a sperm’s ability to find eggs? Does ocean acidification reduce fertilization success? These basic questions can directly impact aquaculture, but are also very informative to conservation biology and ecology. Lauren, on the other hand, will be trying to understand the dominant bacteria in oyster stomachs; aka the “gut microbiome”. Can we associate different gut microbiomes with traits that are relevant to commercial fisheries? Is there a way to develop an inoculation for oyster crops that will make them grow faster? Clearly, this branch of research might serve the commercial sector directly. Photo of the interior of the ‘blue-house’, designed by Nate. On a hot day you can find us all in the air conditioned Blue-House hatchery space that I developed for these studies (see photo above). Feel free to stop by, cool off, and say hello to me and these talented REU students I will be mentoring. If your timing is right, we might even be able to offer a tasty and sustainable bivalve as a snack. See you this summer! This entry was posted in Graduate, Wrigley Institute on June 23, 2017 by Jessica Dutton.